I love crab cakes, but I live in Houston, and crab cakes here are not the crab cakes of Maryland. Typically ours are full of fillers, which is exactly what I didn't want when making these. 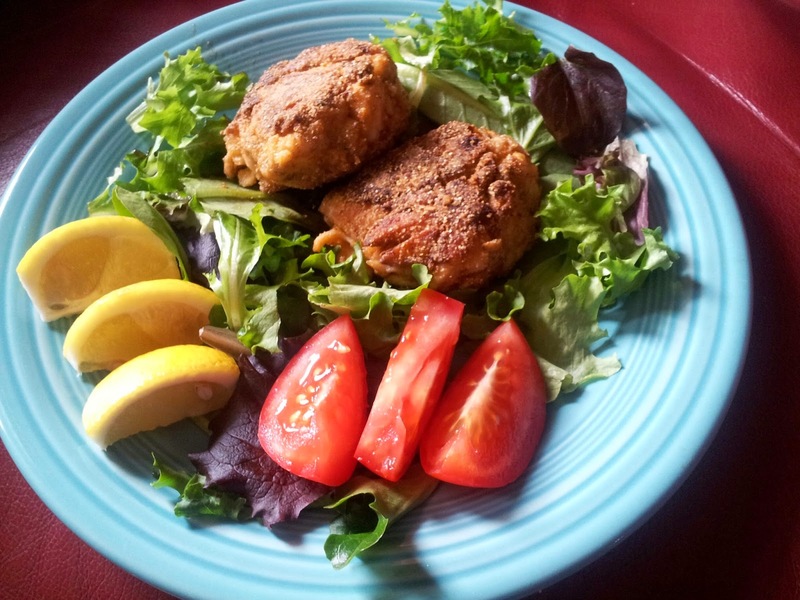 I was excited to be able to make crab cakes using the Slap Ya Mama Cajun products. I started by buying the best crab I could find. I used jumbo lump crab. One pound cost $24, but I didn't price-shop. I will next time though, because these will be part of my cooking rotation at home. This was a fantastic meal for two seafood lovers. I served the crab cakes with a green salad and corn bread. We ended our lunch with bite-sized lime mousse tarts. Enjoy! Drain the crabmeat and pick out any shells. Put the crab in a medium mixing bowl and set aside. In a small bowl, mix the egg, mayonnaise, mustard, Slap Ya Mama Gumbo Mix, lemon juice, Worcestershire sauce, salt and Cajun Pepper Sauce. Pour the mixture over the crab and stir gently. Sprinkle the breadcrumbs and the parsley over the crab mixture, and stir gently. Cover with plastic wrap and refrigerate for 2 - 3 hours. Shape the crab mixture into 7 to 8 cakes, about 1-inch thick. Roll them in the Slap Ya Mama Fish Fry Mix. Heat the butter with the olive oil over medium heat, in a non stick skillet. When the butter and oil are lightly bubbling, add the crab cakes to the pan. Cook until golden brown, about 4 minutes on each side. Serve with lemon wedges, tartar sauce, cocktail sauce or remoulade sauce.